If you're looking for low maintenance, drought tolerant, long blooming and cheerful plants for a flower border or a filler, coreopses are a perfect choice. Native American prairie and woodland plants, their ruggedness and profuse blooms have made them popular with plant breeders. Their common name, "tickseed," is supposedly for the seeds' resemblance to ticks. Even so, birds (particularly Goldfinches) love to snack on the seeds during fall and winter. Bees and butterflies are drawn to them, too. Their daisy-like flowers range in colors from bright yellow and orange to pink and red. Coreopsis form upright clumps and have a moderate growth rate. Plant them any time from early spring to fall; most varieties will start blooming in early summer and repeat bloom periodically through fall. You can find a handful of coreopsis varieties for sale as plants. For the best selection, order from catalogs or start your plants from seed. Hardiness will vary with species and cultivar, and not all coreopsis varieties are perennial plants. Many of the newer varieties are still be tested for hardiness and their ratings may change. Mature size varies with species, age, and growing conditions, but most coreopsis plants reach between 10 and 18 inches in height with a spread of about 12 to 24 inches. They tend to grow in clumps, but many varieties will self-sow throughout your garden. There are also a few that will spread by runners. Some of the taller species may require staking to look attractive, especially if grown in partial shade. Deadheading will keep the plants blooming throughout the summer. Some of the smaller flowered varieties are difficult to deadhead and you may prefer to shear the plants, once the first flush of flowers fade. They will fill in quickly. Coreopsis will bloom best in full sun, but it can also be successfully grown in partial shade. The plants may get a bit lankier in partial shade, but they will adapt. In areas with intense dry, heat, coreopsis may even prefer some afternoon shade. Most coreopsis varieties are very easy to grow and are not particular about soil quality or soil pH. They like well-draining soils and some, such as the thread leaf coreopsis, will tolerate dry, rocky soils. Heavy, wet soils can be problematic for the clump-forming varieties in winter; amending with compost will help. Coreopsis will need regular water when first planted until they are established. After that, they are drought tolerant. Water the plants deeply at least once a week to help new roots grow down deeply. Soil should be damp at about 1 inch below the soil surface (stick your finger in the soil to check.) Early morning watering is best, so the leaves have a chance to dry during the day. 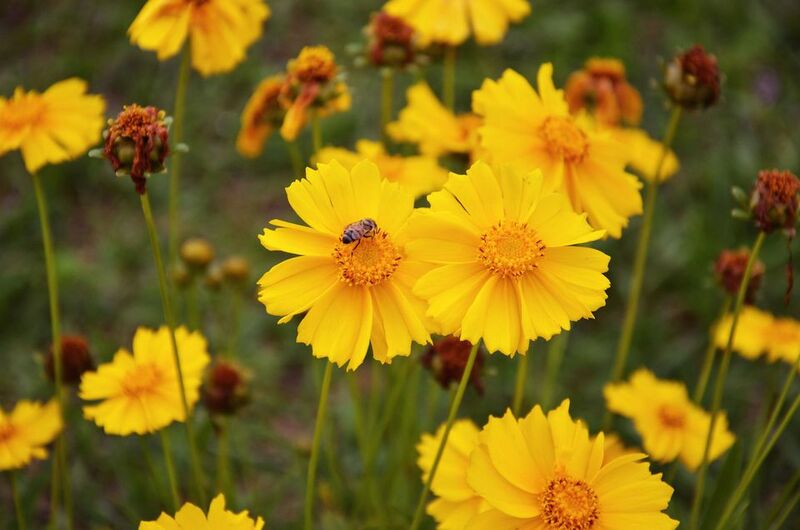 Coreopsis plants prefer a warm climate and because they are native to prairies and dry plains, a dry environment. Occasional wet weather won't bother them, though. Fertilization of growing coreopsis is not necessary—in fact, too much fertilizer may inhibit flower production. If soils are already good, all you should need to do is add a little compost in the spring. Although they are rugged plants, they don't tend to live more than 3 to 5 years. A decrease in flowering is a signal it is time to divide the plants or plant some new ones from seed. For perennial coreopsis, if they begin looking weak with fewer flowers after three years or so, divide them if needed in spring or early fall. Use a trowel to divide the plants into smaller sections. Replant and keep them well-watered until they are established and growing, which can take several weeks. Many, although not all, coreopsis varieties can be grown from seed, either started indoors 4 to 6 weeks before your last expected frost or direct seeded outdoors. Many will seed themselves; however, the hybrid varieties do not grow true to seed. For the most part, coreopsis plants grow problem free. In damp seasons they many fall prey to snails and slugs and fungal diseases can affect them. To avoid these problems as much as possible, give them plenty of air circulation and plant them in full sun.